How to plan 4 days in Madrid? Can you suggest a practical and not rushed 4-day Itinerary for Madrid. Four days is a great amount of time to visit Madrid’s highlights. You’ll have time to eat and do some dancing. You’ll get to two art museums as well as palaces and squares and temples. There is no shortage of things to do and to see in Spain’s capital city. And 4 days will give you a chance to soak in the bustle and keep up with the locals. A 4 day Madrid trip opens up many options of neighborhoods to stay in. My choice is Barrio de Salamanca, a great neighborhood for a longer stay. It is quieter, more residential and safe. Though depending on where exactly in the neighborhood you are you’ll have to catch transport to many of the places you’ll want to visit. But you’ll also be able to enjoy your local ‘hood. The area is full of shops, restaurants, and cafes most of which are geared towards Madrileños rather than tourists like in the center of the city. Check out Hotel Unico Madrid for big, clean, bright rooms and an excellent garden location. If you’re keen to stay more centrally look for accommodation around Plaza de Santa Ana. The nights will be louder and the streets busier but you’ll have great ease of access to everything you want to see in the city. Look at Hotel Orfila for a comfortable stay. Start your day at the Royal Palace of Madrid, the official residence of the Spanish royal family it is only used now for state ceremonies and the royal family does not actually live in it. The palace, while typical of many royal residences is certainly worth taking a look at. Go on a guided tour to get a more in-depth understanding and the history of what you’re looking at. If you’re in town on a Wednesday go between 11:00 and 14:00 when the changing of the guard takes place every 30 minutes. Also, don’t miss the view from the courtyard. Do buy your tickets ahead of time. You’ll have to choose an entry time but you’ll skip the long lines for those who didn’t plan ahead. A normal adult ticket without a guide is €11. The most central square in the city, one of the busiest spots and point 0 for all Spanish roads, The Puerta del Sol is actually a semi-circular square. Go to people watch, relax in a nearby café and just enjoy busy Madrid life. Generally speaking, throughout Spain lunch is the big meal of the day, usually eaten around 2:00 PM and followed by a siesta. So, do as the Spanish do and when the afternoon hunger pangs hit head for lunch. Try Botín, the Guinness world record holder as the oldest restaurant in the world, but you’ll need to make a reservation. Or for something a bit more on the fly go to Casa Labra and stand at the bar eating tapas. A morning at the Museo Nacional Centro de Arte Reina Sofia is a wonderful way to begin day two. Spain’s national museum of 20th-century art is full of mostly Spanish artists with a particular highlight on Pablo Picasso and Salvador Dali, however, the collections are certainly not limited. €8.00 gets you an adult general entry ticket. 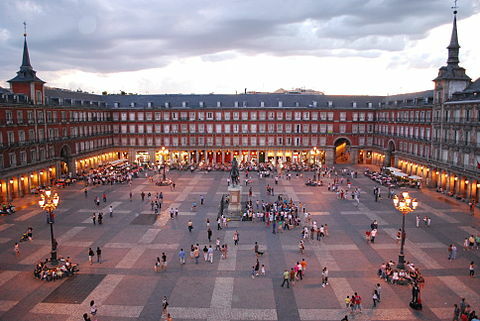 Another famous plaza, not far from yesterday’s Puerta Del Sol, The Plaza Mayor is a rectangular square. Originally constructed in the 1500’s it was ravaged by fires and almost fully reconstructed in the late 1700’s. Today enjoy the shops and cafes which run throughout its porticos. If you’re ready to truly do as the Spanish do that means it’s time to stay out late. As night settles in you’ll notice that no one really goes home, not babies, not children, not grandmas nor grandpas. Life is just getting started as the daytime heat wears off and everyone recovers from their afternoon slumbers. For a classy evening following in the footsteps of some of the greats go to Museo Chicote for a cocktail described by Hemingway as “the best bar in Spain.” Grace Kelly and Frank Sinatra are amongst the stars who also frequented the bar. Ready for another museum? Day three head over to Museo Nacional del Prado considered having one of the best collections of art in Europe ranging from the 12th to early 20th centuries. Goya, Greco, Titian are just some of the many artists featured throughout the thousands of paintings, drawings, prints, and sculptures. A general adult entry costs €15 but if you save your visit until 6:00 PM you can enter for free until 8:00 when the museum closes. Buen Retiro Park is just around the corner from the Prado and a great way to spend the afternoon. Considered the lungs of the city you can see why as you wander throughout the 350 acres of green space. The park is full of statues, fountains, a lake and gardens. Pack a picnic lunch and enjoy the quiet amidst the hustle and bustle of Spain’s capital. If you’re feeling ambitious on day three, ready to conquer the city, head to Temple Debod for a perfect sunset view. Once located in Egypt the temples were gifted to Spain so as to save the constructions from rising waters as a result of a new dam. You can see the temples from outside at no cost and from there you’ll get an amazing sunset spot. If you’d like to enter you’ll have to pass through security but the entrance is free. Check opening hours as they vary according to the season. 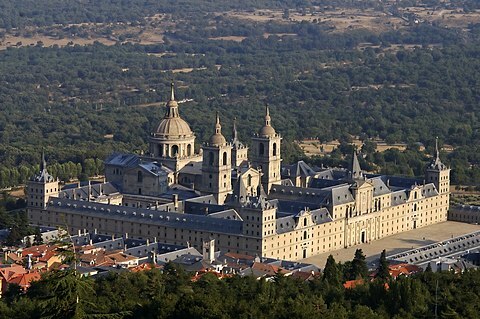 You may only need half a day for a visit to El Escorial but there’s no harm giving yourself more time to explore the countryside surrounding the royal residence. The grounds of the building have a great variety of things to see from galleries to burial vaults, a library, and a basilica. To get there you can take bus or train, both take about an hour but the train is slightly cheaper. If you prefer driving rent a car for an hour’s trip. Give yourself a few hours at the residence before going into town for lunch. Also, be sure to stop at the cross of the Valley of the Fallen a monument built by prisoners of Franco. Sure, 4 days is enough for a first timer to experience Madrid at a comfortable pace, and also see some of the surrounding area. Start your day in Plaza del Sol. What is known as the 0 KM mark of Spain (there is even a plaque that marks its spot) is where all of Madrid’s excitement begins. Sol is Madrid’s epicenter, with many shops, historic bakeries and all kinds of visitors and locals alike. Other historical spots to visit within walking distance include Plaza Mayor, the Royal Palace, Templo de Debod and Plaza de Cibeles. Visit Madrid’s three most famous museums, The Prado, Reina Sofia and Thyssen-Bornemisza. Each museum has something strikingly different to offer. From Prado’s pre-20th century art to private collections and contemporary art. Buy the Art Walk pass for your visit. Get a taste of luxury walking along Calle Serrano in the Salamanca neighborhood. Explore the hipster vibes, artistic coffees and vintage shops in Malasaña. Calle Serrano in the Salamanca neighborhood. Just a stone’s throw from Sol you can enjoy ethnic flavors in Lavapies. Known for some of the best immigrant restaurants in town, you genuinely feel like you are outside of Madrid when walking the streets of this neighborhood. Take a day trip to Spain’s once capital, Toledo. Only a 30min train ride from Atocha, it’s the perfect place to take a day-trip outside of Madrid. Enjoy marzipan and the historic co-existence of three cultures. Four full days in Madrid is good enough to explore Madrid and to appreciate the vibe of the city. When King Felipe II declared Madrid (then a small town) as Spain’s capital in 1561, people from all regions of Spain migrated to Madrid in search of opportunities. Thus, Madrid showcases cultural values of diverse regions that make up Spain. For instance, flamenco and tapas originated in southern Spain but flourished in Madrid. Madrid is famous for its museums. The one kilometer stretch of Paseo del Arte houses three great museums - the Prado Museum, the Thyssen-Bornemisza Museum and the Reina Sofía Museum. See the museums over 2 days so that you are not overwhelmed. Prado alone has over 1,000 works on display and can get overwhelming. Visit Prado museum and Thyssen museum on one day, do not visit any art museum the next day and on the third day come back to Art walk to visit Reina Sofía Museum along with CaixaForum. The Art Walk Pass is a worthwhile investment. The pass allows you to visit the Prado, the Reina Sofía, and the Thyssen-Bornemisza for the price of 2 museums with skip the line benefits. You can buy Art Walk Pass online or at any of the three museums. Try to schedule your visit to The Madrid Royal Palace on Wednesday so that you can witness the change of guard ceremony. You can buy tickets to the palace online. There is no better way to understand a culture of a place than through its food. Start your exploration of Madrid with a tapas tour. Tapas, the bite-sized morsels serve as the best ambassadors of Spanish cuisine. The tradition of ‘ir a tapear’ (going out for tapas) is strongly rooted in Madrid. Tapas tour recreates the charm of tapas bar crawl for tourists. On the day of your arrival sign up for one of the tapas walking tour organized by a local resident. Your tour guide will have plenty of suggestions on cuisines and food which you can try them all over the next 3 days. James Fraser run Adventurous Appetites is one of the many excellent tour operators offering 4-hour tapas tour every evening. By the end of the tour, If you are fascinated by tapas, enroll in a tapas cooking class. Madrid is a nocturnal city that comes alive after dark. Do plan your nightlife by knowing whats on in Madrid during your visit. Arguably, Madrid has the best clubs in Europe. You must visit one of the these nightclubs to understand the pulsating nightlife of Madrid. There is a wide range of tours listed here that offered by passionate local residents. Pick a tour that suits your interests as these themed tours will enrich your Madrid holiday. Thanks to the Renfe fast trains, there are many day trip options from Madrid. My suggestion is to either Toledo or Segovia for an excursion from Madrid. Keep the excursion out of Madrid for the fourth day. For your day trip go to Segovia instead of Toledo. Segovia is less crowded than Toledo. And while it has fewer things to see than Toledo, it makes it much easier to see them at a good pace. The Roman aqueduct and the Alcazar of Segovia are the most impressive. There are also other castles in the area around Segovia, if you have time to drive 30 minutes from the town. And the cuisine in Segovia is excellent.